Maintaining your home may take up too much time, but consider other not-so-obvious reasons you can’t keep up with cleaning your home. If you’re like me, your home was immaculate before kids. You vacuumed every week and polished your windows for a sparkly shine. You came back from work to a tidy home. And you returned the dishes to their proper places and the floors mopped and swept. Organizing your home was a breeze. And if you truly are like me, all that went down the drain once you had kids. The biggest culprit we all share? Lack of time. We have too many responsibilities with the same time we’ve always had. That much is true. But could you be guilty of other, not-so-obvious reasons you’re overwhelmed with household tasks? 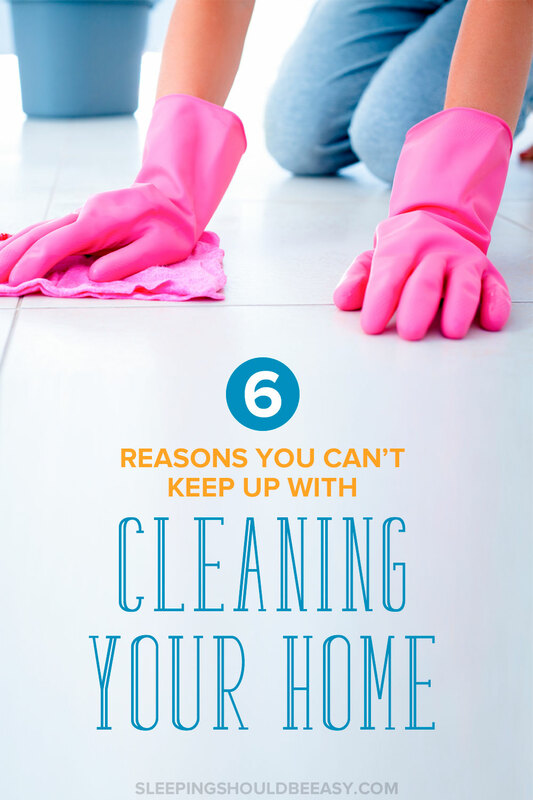 Below are six surprising reasons you can’t keep up with cleaning your home. Yes, deep cleaning too often can make you feel worse than if you didn’t do this so much. Daily deep cleaning with kids in tow just isn’t as possible as it used to. Opt instead for daily maintenance and sanitary standards. Washing dishes, wiping down counters, laundry and mild vacuuming come to mind. Save the heavy duty cleaning for when you expect visitors, or limit it to once a month. No one is going to notice the streaks in your window or that you haven’t bleached your shower stalls. Doing chores when you’re pregnant is going to make you feel worse. And your husband out of town for the week gives you a complete pass to not sweat the little things. Going through big changes like a new job or attending your friend’s wedding? Don’t worry if you didn’t get to check everything off your list. Same with having just given birth and bringing baby home. Now isn’t the time to worry about keeping your home spotless. Putting that pressure on yourself adds stress and burnout. Acknowledge that things are hectic and will get back on track when things settle down. You don’t need to maintain the same level of standards all the time. Read more on how to avoid parent burnout. How equal are you and your partner with childcare and household tasks? When you have sole responsibility for keeping your home clean, you’ll feel burned out. This doesn’t mean you do everything 50/50. One parent might be home more than the other and have a better chance to pop clothes in the laundry. But both parents should do something to contribute to your home. Dad usually does the “once in a while” tasks of fixing a leaky pipe while mom does daily chores. But how often does the pipe leak versus the dishes need cleaning? Mom has the burden of doing daily tasks that take more time than dad’s once-in-a-while tasks. Both parents need to pitch in whenever they can so one person doesn’t feel like he or she is doing more than the other. Read more on whether you and your partner have equal duties. At first, this makes sense. 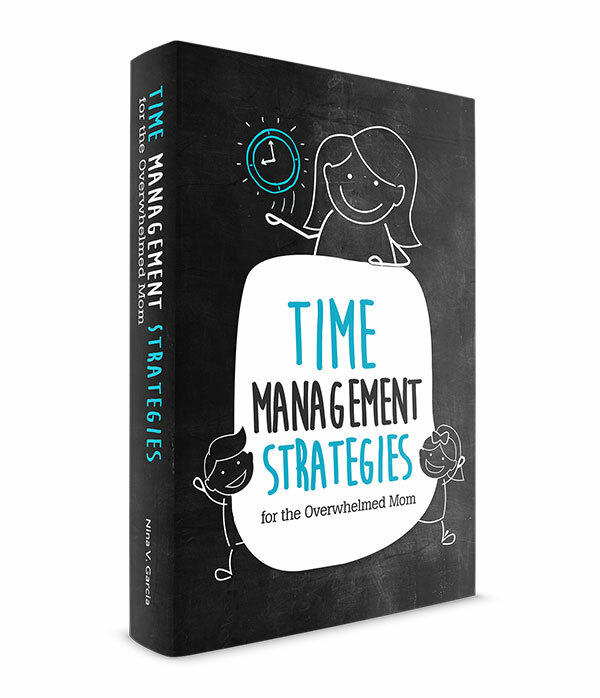 How else can you get chores done efficiently and quickly when you have kids to attend to? And for many chores, nap and bedtimes are the ideal times to do just that. Play peek-a-boo with the baby while folding laundry. Set up a play area in your kitchen while you cook a quick dinner. Make putting toys away a game. Teach your kids how to spray and wipe surfaces (or give younger ones a clean rag to practice). Vacuum the floor while the kids play nearby. Some chores are better done alone, such as bleaching the sink or mopping the floor. But don’t feel like you can’t get anything done until the kids are in bed. I live by lists, and one of the best ways to clean your home is to write it in a list. Print a list of long-term chores you’d like done and write either your name or your partner’s next to it. Include a due date so you know when you need to do them. You can also print a chore list for daily tasks, like remembering to take out the trash. You won’t have to remember everything you’d like done for the day (I, however, just clean when I see the need for it. Clothes are piling up? Time to do laundry!). The downside of having too many things is you’ll also have too many things to clean. 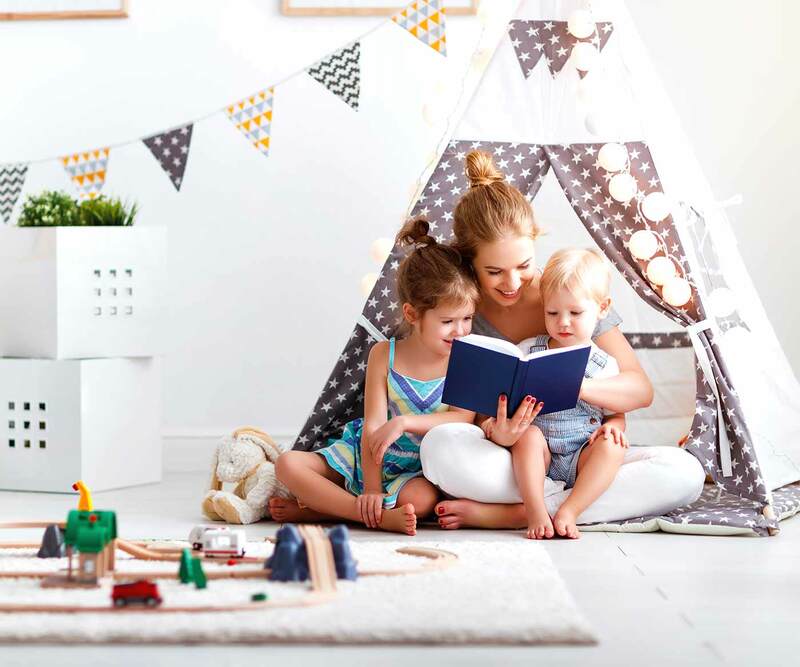 From appliances to clothes to kids’ toys, clutter can add to your already long list of chores. Aspire for a minimalist lifestyle and only buy and bring into your home things you want or need. Rotate toys and store some in the closet so only a few are visible at a time. Donate or sell outgrown or unflattering clothes and toys as well as gadgets and decor you no longer use. Keeping your home free of clutter not only makes it more welcoming but lessens the time you need to clean it. Get more tips on how to practice minimalism with kids. Maintaining a semblance of a clean home may not be like how it was before you had kids, but it is possible. Keep realistic expectations and standards of your home. Involve your partner and your kids. Organize your chores into lists and remove clutter as much as possible. Your home may not look magazine-worthy all the time, but you’ll be able to relax, enjoy and keep up with cleaning your home. Did you like this article about why you can’t keep up with cleaning your home? Share it on Pinterest and Facebook! I wasn’t that great at cleaning before kids, and now it’s really tough. Especially since I got used to having house cleaners for a while but I haven’t found any since we moved. I am doing well if I can keep up on the daily stuff but I’m terrible about deep cleaning… I’m definitely not doing it too often! I think I need to work on a cleaning list to help keep me headed in the right direction. I periodically subscribe to the flylady emails when I’m feeling really overwhelmed, but then I get email overload and turn them off. I can imagine it’s a challenge to clean now with kids if it wasn’t already something you’ve done before them. Great tips Nina! I’m definitely living a minimalist lifestyle! LOL. My entire closet can fit in one big luggage. We don’t even have a couch at home. Too minimalist I should say. Geez. I do small clean-ups daily when I get home like sweeping the floor and dusting. My husband and I take turns in washing the dishes. I also ask him to do the heavy tasks like mopping the floor. I can’t do deep cleaning daily because my job is already tiring as it is. Haha definitely a minimalist, Rea! I don’t mind dusting but yeah, like you I can’t stand mopping. I love this post!!!! I’m a very clean & neat person but yes, after having kids, I’ve really had to re-evaluate my standards. One, I made a list & do them monthly. Sometimes I sweep the floor weekly near the entry because of winter salt and leaves every other day of the year. Other things, I’ve had to let go or at least do them even less frequently than once a month. I’m glad my husband doesn’t complain (anymore) about the state of our house because then I’d have to blow up at him and tell him to clean something once in a while. Actually, he does his share, it’s just different than my share. I have to remind myself of that. Yay Lisa for your monthly list! And yes I totally know what you mean about sweeping that entry way lol. For us, it’s sand. I also clean when something irks me enough to do something about it. Like, today I wiped the bathroom mirrors because all that water splatter stains just got to me after a while! This is so spot-on! We sound so much alike! My husband and I are both extremely clean people. Our house always had minimal clutter and it was always clean before kids. Now, the clutter accumulates more easily and sometimes cleaning feels like a losing battle. Over the past year, I’ve really learned to let things go. Things are still clean, but with small kids, they can’t stay super clean. And with a lot of stress right now, I’ve had to re-prioritize. My biggest tip is to spot-clean. Don’t have time to mop the floor? Use one of those mops that shoot out cleaning solution and clean up the small offending area. When the bathrooms need a touch-up, I use disinfecting cleaning wipes and get all the main surfaces. It gets us by for a day or two until I can clean things the way I normally would. One thing I never slack on is dishes. They get done every single day. Since I feel like we are in the kitchen constantly, I try to keep it a clutter-free, clean zone. I can control that. It makes me feel better, especially when I see what a disaster the living room becomes when the kids are playing during the day! Great tip, Vanessa! I think I do this, especially in the kitchen. Like, my counters will look terrible after cooking, and I just need to wipe it up to make it clean, even if the rest of the kitchen isn’t wiped. Same with dishes (we really ARE the same!). I don’t know how dishes can be left piled because then there’d be no room to do anything else (like rinse fruits or wash hands or even put water in the filter). And yes, nothing better than visitors to inspire us to clean. That’s when I make sure at least all the visible stuff is presentable haha. Great tips Nina, I think I’m guilty of a few of these points. Glad we found each others blogs! What a cool and unique post! I think in our case it’s HIS partner that doesn’t do enough, but I’m working on it! Lists help. #3 and #6 are what’s killing me. My hubby works a lot of hours, but honestly? So do i! And his time off is when the kids aren’t home. I get that he wants to relax then, but I’d kill for some kid-free cleaning time! Keeping a home clean sometimes seems like an impossible task. Though I have to admit our house wasn’t spotless before kids – even with as I wanted it to be. We used to have a cleaning service, and it was fantastic. Even though we hated the bi-weekly scramble to get the house ready, having it on the regular made sure that things didn’t get too bad. These days, we just do what we can when we can. On the plus side, I think that seeing us constantly try to clean things up these days is having a positive effect on our oldest. When we were home over the snow days, she started to pick up the toys while I would put the little one down for a nap. That way we could have some more “us” time. It was awesome. That’s so sweet for your eldest to pitch in! Isn’t it the best when they do things on their own without us asking? Having a chore list makes a lot of sense. Unfortunately for me, we have kind of a big yard, so my husband gets the unenviable task of taking care of the outdoors, leaving me the indoors. I can’t ask him to help me. He has his hands full already when it comes to house duties. Luckily, the kids are getting older. Sweeping under the table is something they actually enjoy! I love it when the kids can contribute to chores! And yes, chores don’t have to be divvied by 50/50—I think what’s important is for both parents to feel content with their arrangement, with no resentment for either person. These are TOO true! I think #1 is a big deal especially, as well as #6. We are working on #3 and 4 in our house. Yup, it’s not just lack of time that we can’t clean—so many other reasons come into play, too. I totally save chores for when the kids are awake–I always have. They can help, or they can find something else to do. Usually, it’s a mix of both. Right on, Brittany! I notice a huge difference when I do. I have more time for myself in the evenings too. Some chores are better when they’re asleep, but nearly all chores can be done when they’re awake. Lena do you have twin boys? I do too! I’ve found that clean is good enough, and like you said, having everything polished and tip top just isn’t going to happen until the kids are much older. Admittedly, I don’t have a chore list. But the kids have regular chores and we have a designated family clean up time, so it stays okayish. 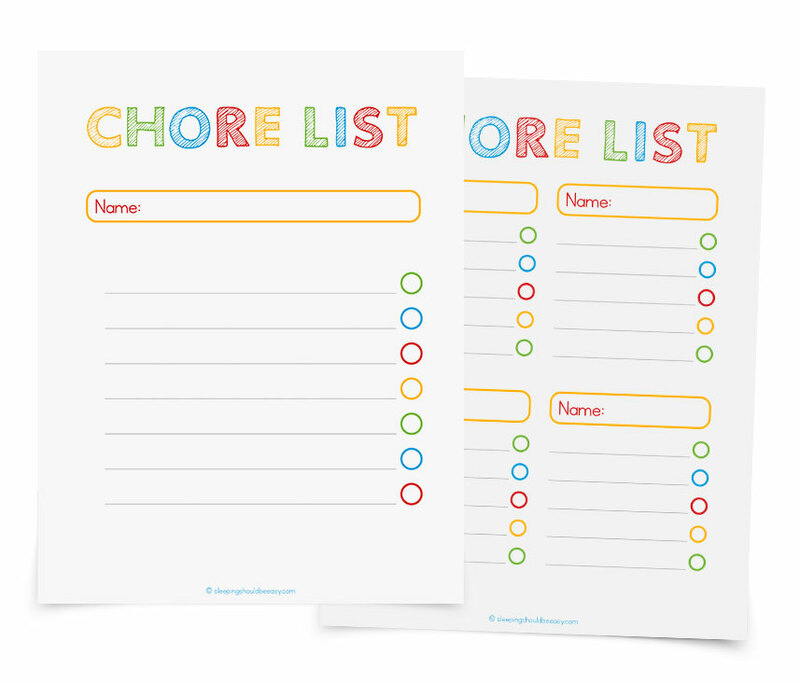 Kristy I also don’t have a physical chore list either but like you, my kids have regular chores they know to do. Have to agree with #6 – clutter makes it harder to clean, no doubt. And I was guilty of #4… I would nap more if I could when they were sleeping. Yup, clutter can be such a big factor in how well you can clean your home. Too much just becomes an eye sore too! 24/7 and I’m fed up. I hate housework as I feel like it’s s never ending cycle that is a waste of energy. I can imagine, Carly! I started with simple chores, like washing a dish or two, or putting away toys while they played nearby with something else. I have been married for 18 years & I pretty much do all the house cleaning & took care of the kids. My husband is on ‘light duty’ he does few dishes here & there & a quick mop ‘just our tiny kitchen & a hallway but he never moves anything or tire himself out. I now have two teenager they help a bit but sometimes they just ignore me so I end up doing all the work! I do put cloth in wash every other day. I fold cloth every day at 8:00PM. Kitchen is done everyday! I assigned a day for each bathroom for deep cleaning but a quick counter wipe is after I brush my teeth. There is nothing better than waking up to a clean bathroom! Sometimes things are not perfect if my husband complains I just say ‘I am a human after all’ & I just don’t have the energy like I used to. Meaning ‘HELP’ if you don’t like how our house looks.